The old wip topic had the previous game system, I am going to do some adjustments to it for the next game's version, this topic is for discussion and gettign ideas on it. The previous system was heavily based off kof and the rumble fish, I plan to still keep it similar to that but still change around 30% of it. 4 attack buttons: two kicks, two punches, weak and strong. character specific dir + button attacks. attack clashing: if two attacks with the same clash priority hit each other the characters can cancels to another attack as if they had control. projectile cancelling: certain attacks can cancel certain projectiles when hitting them, not limited to special attacks but regular attacks too. taunt: you don't recover control until the animation is over, while taunting you gain power at an accelerated rate, so a taunt that last 30 ticks gains 30 power, but a taunt that last 60 ticks gains 90 power (not the exact values, just an example), it also damages the oponents guard bar. 2 button grabs with a miss animation: press two punches or two kicks. escapable. roll forward/backward: press weak punch and weak kick together, invulnerable to attacks and projectiles and vulnerable to grabs, the very last part of the roll will be completely vulnerable to any attacks. advancing attack: press strong punch and kick together uses 3k power it's a fast attack that puts you close to the oponent, can be cancelled on contact to any attack, can be cancelled into from basic and dir + button attacks. opens up juggling. defensive art: press strong punch and kick together, works like a combo breaker, will use 2k power. special attacks. standar, no ex moves. 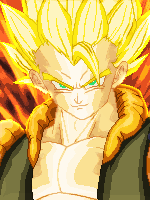 2 levels of super attacks: one level will use 1000 power, the next level will either use 2 or 3 thousand power. juggle system. will use a bar, previous version had infinite juggling I plan to change that but nothing has been decided on how the new system will work. guard break system. standar, autorefillable, the guard break animation will be more vulnerable than average (so, more like omk than kof). skill bar: it fills with time, very specific attacks and or situations alllow you to fill it faster. it's uses and levels are still undecided. just defense: tap back while blocking instead of holding, you don't receive guard damage and recover faster. cancel specials to other specials: while doing a special attack, the character can cancel to another special attack, costs 1k power. cancel specials to supers: while doing a special attack, the character can cancel to a super, costs 1kpower. powered up mode: uses 3k power bar; will pause the game for around 30 ticks, it last for a limited amount of time, allows you to do chain cancelling, weak to strong and strong to strong, you can also perform special to special cancels and super cancels but those make your powered up state last less, performing a super ends it immediately. The stuff in bold is stuff that is subject to change, mostly because I am adding the skill bar from the previous version of the game. While not having it meant that there was no such thing as an simple optimal combo for all charcters, since using certain cancels in a combo meant you would not be able to use lv2 supers or power up and I liked that, it still feels too limited and basic compared to current games, I still want to keep the non optimal combo idea and go more for situational combos/strategies while adding another layer of complexity with the skill bar. Made this a separate reply to avoid cluttering the first post. My first step would be separating the stuff that uses bars. I am leaning to use 3k power and 1k skill. ----- this is the current satte of affairs. 1k power or 1k skill, 1k skill is too much so either I make the skill bar 3k or go for power. the super already has got a power cost depending on the level, so 1k skill will be good for this, but what if I decide to have 3k skill instead of 1k ? 2k power, still leaves room for super cancel based on either power or skill. 3k power, only leaves room for super cancel based on skill. 1k power + 1k skill, leaves no room for super cancel based on skill unless I have 3k skill, but then that means being able to do 3 lv2 supers in a row if not cancelling. 2k power + 1 skill, can super cancel based on power, can't super cancel based on skill unless I go for 3k skill in which case I still keep 1k skill and 1k power, not enough for another lv2 super, but still useful to continue fighting. grab scape, regrab. the first scape should be free since it's heavily based on reflexes. then it becomes a matter of spending either power or skill for more scapes and regrabs. The scenario is p1 grab, p2 scapes for free based on reflex/expecting a grab, p1 regrabs using 1k power or 1k skill, p2 scapes using 1k power or 1k skill, this keeps on going until one runs out of skill/power. having 3k power 1k skill means that skill can't be used for it only allow one step, I can consider having p2 change to grab as a higher cost. this is still pretty messy, maybe using power for regrabbing, skill for scaping, having 2k or 3k skill makes this feasible, hell, even 1k skill might be enough. so, it changes to (1k skill) p1 grabs p2, p2 scapes using 1k skill, p2 regrabs using 1k power, p1 scapes using 1k skill p1 regrabs using 1k power... only the regrab sounds cheap as any player can input the regrab, if i make it 2k power that means that no player can regrab twice thus giving an advantage to p1 as it should be because he started the grabbing. defensive art. this one is easy, 1k skill. since the skill bar depends on time this means only one combo breaker and you have to save skill up by not doing other stuff/cancels. advancing attack. the priority here is not being able to do more than one of these in a regular combo, using 1k skill solves this and so does using 2k power, but I want to carefully balance this attack with supers/super cancels and powered up mode. powered up mode. it gains you a lot of combo oportunities by giving you a lot of advantage on start up, one of the initial drafts had it being cancellable from attacks, similar to kof 2k2/13 overdrive/max modes, I went against that because I want to keep the advancing attack useful. the 30 or so ticks advantage on start up solves it by making it so you can hit confirm this, youc can either power up to have advantage over p2 or to punish when you see him becoming vulnerable and I am positive this can be used in "hit confirm" for links, very easy in the case of a jump in. This one should be very costly, so 1k skill bar is gone, in the case of having more than 1k skill it will use all of it anyway. most likely it will also use 3k power so while in theory you can't do supers, being powered up allows you to use supers at the cost of the powered up state. This whole mess with super cancels makes me consider 2k skill as a viable option, but I will try to keep it to 1; 3 skills seem less viable same as 5k power. When we can have a video or screenshots ? of the game system ? I am working on mai as things go on, so I guess the first video with the game system will be out once I am done coding it for mai. I read your explanation about the regrab, and it makes sense. But still, 2k power to regrab and win looks like a lot. I hope it really deals a lot of damage at this point. yeah, I put it here for the situation in which p1 starts the grab, p2 scapes using 1k skill, p2 regrabs , p1 scapes using 1 k skill, if i used less power for regrab p2 would still be able to regrab p1 in this situation and there are not enough skill points left for another scape; the player starting the grabs should have a bigger advantage. somehow it feels better to just use 1k power and allow p2 to revert the grab than increasing the damage of throws. there have been two big changes since the previous post. this was done to stream line commands because the multiple buttons press and dir + button inputs had grown too much. rumble fish style chain combos dropped, chain combos while powered up will be the regular weak medium strong style. more options for special attacks. less dir + button attacks, a lot of those will move to mediums attacks. some of the dir+ P and dir+K follow ups (angel, raiya) will eb changed to simple button presses. target combos will exist, since having 6 buttons makes them a bit more interesting to input as opossed to the generic feeling of them with just 4 buttons. that also allows me to keep certain signature combos with the characters while still moving some dir+button command to simpel button presses. medium and strong attacks have different hit times, so certain attacks will be able to combo after a strong but not after a medium. changes on the juggle system plus overall combo system. this is the most interesting one, imho. I am trying to play around with the mechanics for the combo system; the folowing paragraphs will be a lot of theorizing how I want the game to play out. The normal method to start a combo will be jump ins, running and hitting or using ranged attacks (the latest is with the adittion of medium attack ). after the jump-in you continue with a filler (starting with running or ranged attack means starting with a filler right away), the filler could be a medium or strong attack , followed by a dir + button attack , the filler can also be a target combo. then comes the special attack/ super; they will have very different properties so this is when things should get interesting. a) knockdown: these super/special attacks will knowckdown right away or just generally hit in a way that you can't continue the combo. b) launcher: these will make p2 fall but will send him high enough so you can continue juggling p2. c) wall bounce: these will bounce p2 on the wall; provided you have a proper distance to it you can continue juggling, unlike launches the x velocity of p2 will be high enough so in practice you can only juggle p2 after he has bounced off the wall. d) ground bounce: those attacks act similar to launchers, p2 will hit the ground and bounce back, you can juggle p2 once he is bouncing. e) critical hit: those won't make p2 fall, their hit stun will be long enough to allow you to link more stuff after they hit. after hitting p2 with a special, basic attacks hitvels (for juggling ) have been changed so that you can do another filler then cancel to another special. in practice there are several ways to prevent such combos, the most obvious one is that most character won't be able to do all that, as an example mai will have critical hit, ground bounce but no wall bounce or launchers. the special attacks properties will be more flexible, like, an attack won't always cause critical hit, but will only cause it on counter hit, same for launching, ground bounce, etc... it will depend on p2's state. those are some of the basic rules I have tough tout for comboing, but there are still two more factors which are the advanced attack and the power up mode, first I will talk about the advanced attack. powered up mode also allows you to extend combos, but it's use is not as obvious as the advanced attack; you enter power up mode by pressing one punch and one kick of different strength when you are idle, your character plays a power up animation then you gain certain advantages for a limited amount of time, one of which is being able to perform chain combos (you could also gain free cancels, supers, etc... I have yet to put it to test to see how it would work out better). to extend combos using powered up mode you have to finish your attack animation then enter the mode, since it gives you a frame advantage on activation so you can link attacks after activating it, so you can do a linker, wait until you recover, enter power up mode to do yet another linker. advanced attack and powered up mode should not be abusable for they use kill/power bar so you will only be able to use one of them in a combo. Having crits is good, I always wanted to implement that.